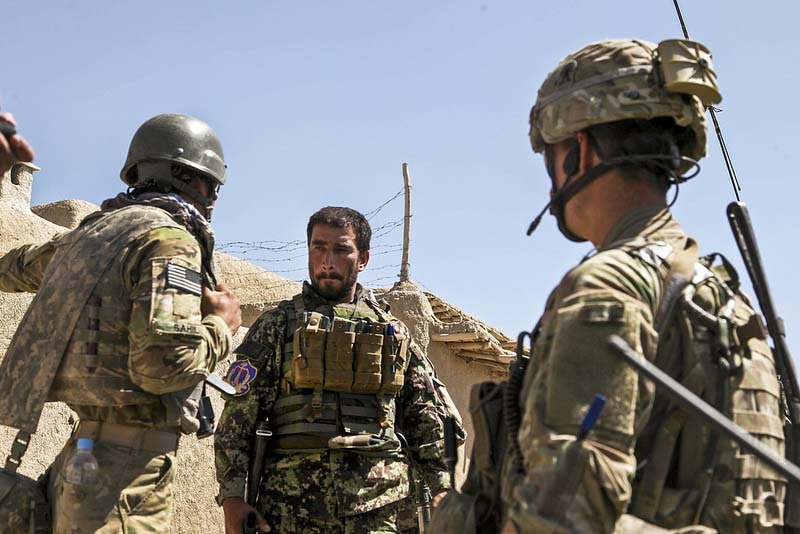 Home Tags Posts tagged with "joint operations"
NATO announces that it is restricting operations with Afghan troops following a string of deadly attacks on its personnel by rogue Afghan security forces. Only large operations will now be conducted jointly, with joint patrols evaluated on a case-by-case basis. ISAF said these were “prudent, but temporary, measures to reduce our profile and vulnerability”. NATO commanders have been frustrated that the Afghans have not done more to stem the rise in attacks, analysts say. The moves came as a suicide bomber targeted a bus carrying foreigners in the capital, killing 12 people on Tuesday morning. The attack happened on a major road leading to the international airport and reports suggest those on board worked at the airport. Afghan insurgent group Hezb-e-Islami has claimed it carried out the attack, which it says was in response to a recent anti-Islam video. Meanwhile NATO-led ISAF forces said they had arrested a Taliban leader and two insurgents they said were involved in an attack on the sprawling Camp Bastion in southern Helmand province. They said the leader was suspected of “providing support” to the militants who staged the audacious assault, killing two US marines and destroying six Harrier fighter jets. The joint command of NATO-led ISAF international forces cited “events outside of and inside Afghanistan” related to the film as part of the reason for its restrictions on joint operations. Afghanistan has seen days of protests over the video, some violent. Those, along with the surge in so-called “green-on-blue” attacks, had prompted the new restrictions, ISAF said. Fifty-one NATO troops have been killed by Afghan soldiers so far this year – 15 in August alone. In 2008, just two soldiers died in such attacks – though ISAF and Afghan force numbers have also increased substantially in the period. Four US soldiers and two UK soldiers died in rogue attacks at the weekend. A fifth of UK soldiers killed this year in Afghanistan were killed not by insurgents, but by Afghan soldiers or police. Joint operations will now only be conducted routinely at battalion level – large operations involving several hundred troops. “This does not mean there will be no partnering below that level; the need for that will be evaluated on a case by case basis” but it will have to be approved by a two-star general, ISAF said in a statement. It stressed the changes were temporary. “In some local instances, operational tempo has been reduced, or force protection has been increased. These actions balance the tension of the recent video with force protection, while maintaining the momentum of the campaign,” ISAF said. It insisted it remained “absolutely committed to partnering with, training, advising and assisting our ANSF [Afghan National Security Forces] counterparts”. In a news conference, US Secretary of Defence Leon Panetta told reporters he was concerned about the effect of insider attacks. But he insisted they did not mean the Taliban was getting stronger or regaining lost territory. He said the US would do all it could to minimize risks to its forces, but “we will not lose sight of the fundamental mission here, which is to continue to proceed to assure a peaceful transition to Afghan security and governance”. In practical terms, US soldiers are already staying on their bases, while Afghans carry out patrols alone. There has been enormous frustration among NATO commanders that Afghan officials have not been doing enough to prevent the rise in attacks, our correspondent says. This shift is clearly aimed at sending a signal to the Afghan government that its measures for vetting new entrants to the Afghan army and police force must improve, they say. But with 7,000 new recruits a month joining the Afghan army alone, it is very challenging to ensure Taliban militants do not slip through the net. The Afghan ministry of defence said it had not been formally notified of the changes until a hurriedly convened meeting with NATO on Tuesday. NATO’s move comes after a week of protests triggered by the anti-Islam film, produced in the US, which has caused a storm of anger around the Muslim world. On Monday, hundreds of protesters threw rocks and torched police vehicles in an angry protest against the film in Kabul. The AFP news agency said hundreds more staged a new protest in the northern city of Kunduz on Tuesday.